Ready to be more productive and integrate with other apps? With iOS URL Scheme, certain commands can be sent from third-party apps to TickTick and you can build your own workflow through URLs. This guide will explain how it works. Add tasks: create a new task named “Buy some eggs”. Show smart list: Show the “Today” list. Search tasks: Search tasks with the keyword “Meeting”. Open these links will launch TickTick and execute the command. TickTick currently supports three kinds of commands, including “add_task”, “show” and “search”. 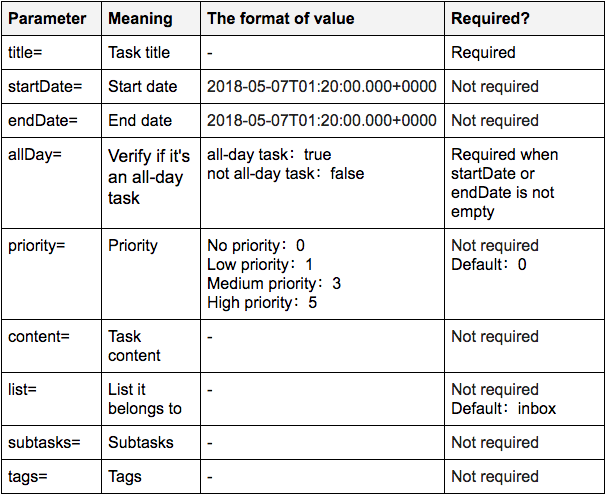 In each command, there are one or more parameters, when adding a task, you can input “title”, “startDate”, “list” and other parameters we provide. Each parameter corresponds to a value, for example when adding a task, the value of “title” can be “Buy some eggs”. This command supports the x-callback-url protocol, in which it allows you to go back to the previous app after successfully adding tasks in TickTick. TickTick currently supports three callback formats: x-success, x-error, and x-cancel callbacks. 1. Create a task named “Buy some eggs”. 2. Create a task named “Buy some eggs” at “6pm” in “shopping” list. 1. Show the smart list “Today”. 1. Search tasks with the keyword “shopping”. If you are using the Workflow app, you can open the URLs below and try them out! If you are using the Drafts app, you can open the URLs below and try them out!